Until now, importing your data into Simple Sales Tracking has been limited to Contacts and Leads. If you had wanted those Leads to be Opportunities or Accounts, you would have had to Covert the manually. You’ll notice now, on Step 2 of the Lead import, at the bottom of the page, a new drop down list which asks you to choose at which stage you want to import the data. By default, this is still Leads. Optionally, change this to either Opportunities or Accounts to import directly to this stage. Keep in mind that First Name, Last Name, Job Title and Company are fields that only exist in Leads. After the Lead stage, that information gets seperated out as a Contact. We’ve added 2 new report to capture more details on the dollar amounts of your opportunities. Grouped by Account, both a summary and detail Opportunities report have been created which include a Sum total of the Low, High and Actual (dollar) amounts. The summary report also includes the Expected Closed Date as well as your User Defined fields. The details report includes additional fields. 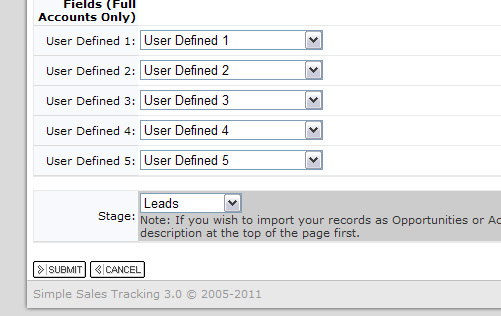 Additionally, we’ve added your custom user defined labels to each of the Sales reports. Until now, a generic column header was given, which did not reflect your custom naming. You’ll find this has been put in place. You’ll also notice something new on the detail pages of your Accounts. In the “Opportunities” box, where you’ve associated an Opporunity with an Account, you’ll find that the amount columns now give you a Sum total, simliar to what’s being generated in the new reports. Finally, as you know, the majority of list pages within Simple Sales Tracking default to showing records which have a status of “In Progress”. We’ve now changed this on the Accounts list page. Since an active account could be considered either In Progress or, more likely “Won”, we’ve decided to show the list without filtering by status.